With the Presidential election just five days away, there are many pressing issues Americans are still debating before they hit the polls. Obama or Romney? Yes or no on Prop [insert number here]? In the spirit of the upcoming election, the UFC has released a couple of videos featuring two of their most politically correct athletes who happened to be fighting on November 17th. Who will you choose? 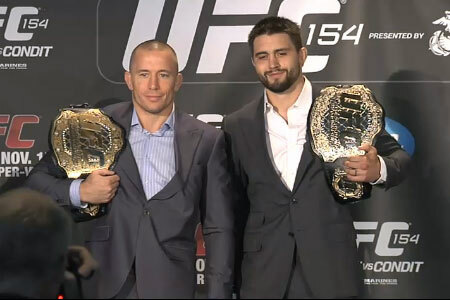 Incumbent welterweight king Georges St-Pierre or interim 170-pound champ Carlos Condit (Pictured)? UFC 154 takes place inside Montreal’s Bell Centre.